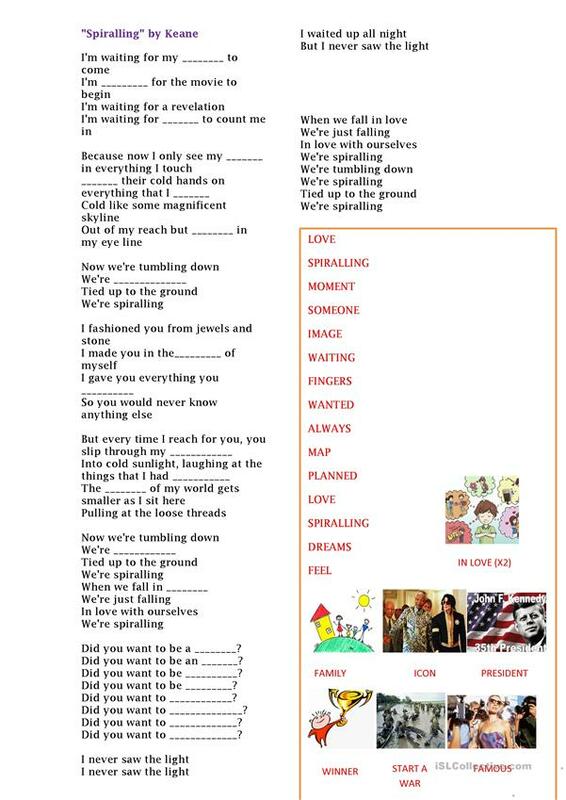 English song to practice, simple past, and simple present. This downloadable printable is intended for business/professional students, high school students, elementary school students, adults and students with special educational needs, learning difficulties, e.g. dyslexia at Beginner (pre-A1), Elementary (A1), Pre-intermediate (A2), Intermediate (B1) and Upper-intermediate (B2) level. It is great for consolidating Past simple tense in English, and can be used for strengthening your groups' Listening, Speaking and Writing skills. Ale2311 is from/lives in Peru and has been a member of iSLCollective since 2012-04-30 17:46:28. Ale2311 last logged in on 2019-04-26 00:00:37, and has shared 19 resources on iSLCollective so far.